Brand NEW Custom Project Salvo! The new U.S. Army Paintball Marker, Project Salvo + a couple extras to make this thing really pop! 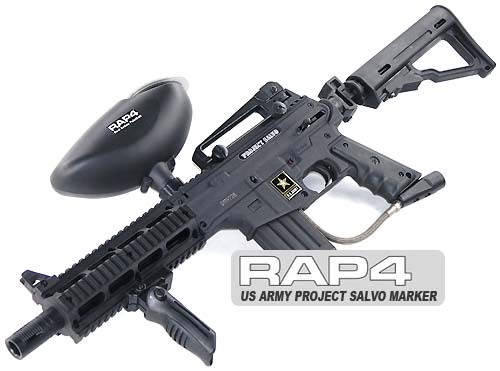 The Tippmann Project Salvo is an exciting new marker from Tippmann U.S. Army Paintball; the same line as the Tippmann Alpha Black. It features a six position collapsible and foldable stock, an AR15 style shroud with four built-in Picatinny rails and a new AR15 style magazine that doubles as a helpful toolkit. The marker also incorporates a flat-top Picatinny rail built into the receiver, which makes it simple for players to quickly add a handle, site, scope or a variety of other modifications. As an added benefit, the Project Salvo marker can be easily enhanced with an eGrip as well as several other performance upgrades from the Tippmann 98 Custom® Platinum Series, including the Cyclone Feed System, Response Trigger and Flatline barrel.